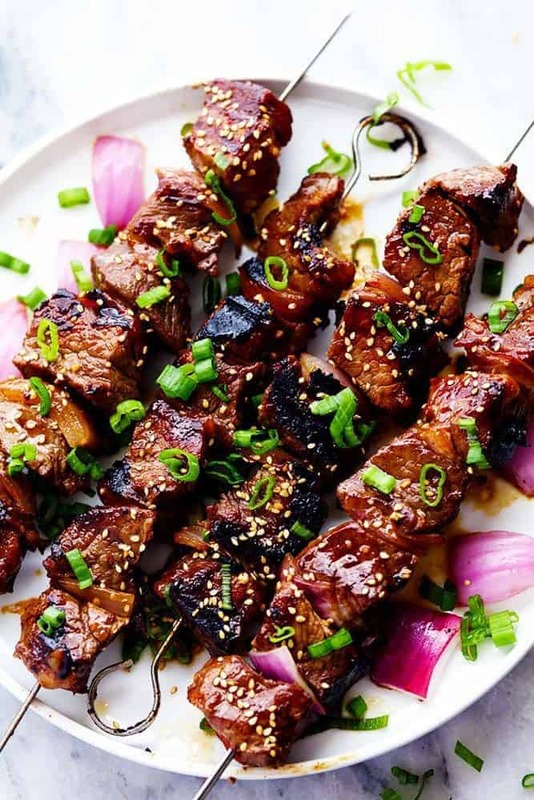 Grilled Asian Garlic Steak Skewers are marinated in a delicious asian garlic sesame sauce and grilled to tender and juicy perfection! Ok ok I admit that I have a bit of an obsession with asian foods. But this recipe was FANTASTIC! Anything that involves soy sauce, garlic and sesame oil is an instant favorite in my book. This recipe was simple to put together and the flavor is out of this world good. I am pretty picky when it comes to steak. It has to be tender and melt in your mouth. I just can’t do the tough and chewy but it takes cooking the steak just right. Also buying a high quality steak helps too you just can’t over cook it. A tenderloin can be a little expensive but will get the best results. A chuck roast is a little less expensive but can tend to be a little tough and chewy I have found. A sirloin tip is a good balance between the two and will deliver amazing results and a great kabab. They marinate for a few hours in a simple soy sauce garlic marinade. 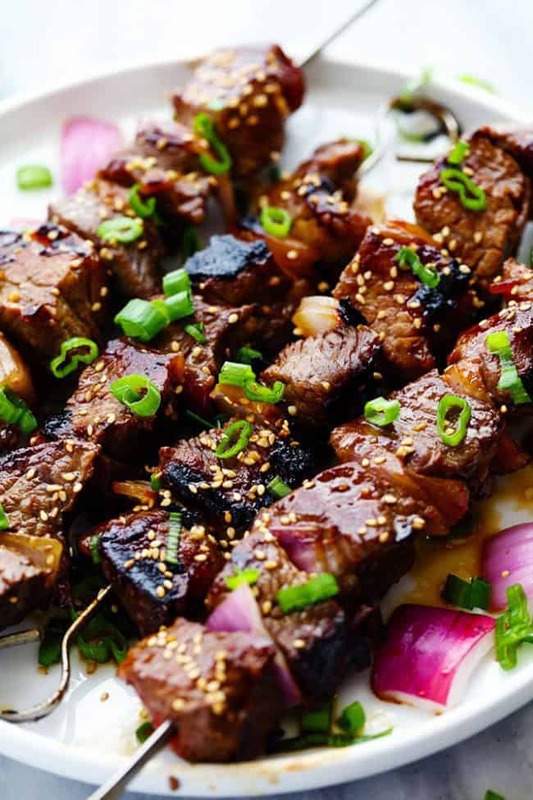 The marinade just seeps into the steak and gives it such amazing flavor. As soon as I had my first bite of the steak it became an instant favorite. Tender, Juicy, and full of flavor. You guys are going to love these as much as we did! 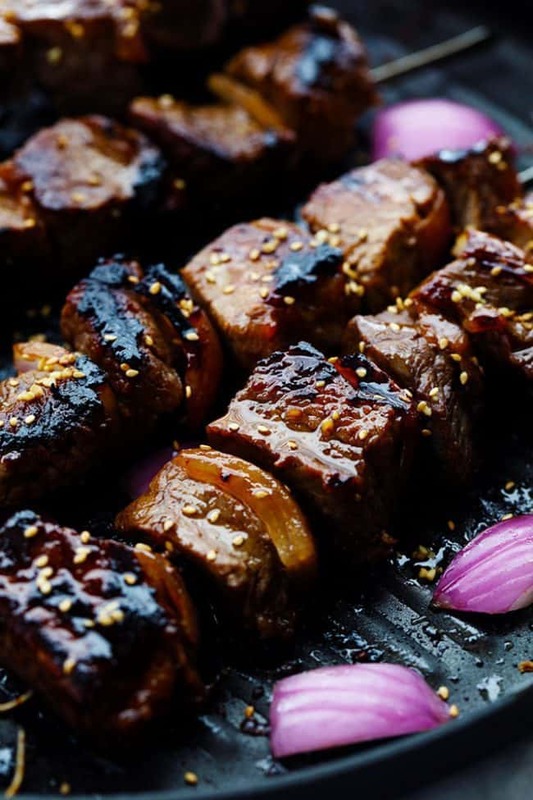 Grilled Asian Garlic Steak Skewers are marinated in a delicious asian sesame sauce and grilled to tender and juicy perfection! In a large bowl whisk together soy sauce, garlic, sesame oil, vegetable oil, sugar, ginger and sesame seeds. Add the steak and toss to coat in marinade. Marinate for 3 hours or overnight. Marinade sounds just amazing! And looks so good! These look like they have big flavor. A must try! Absolutely delicious! This will be on the menu again and again! do you think I could throw this in the broiler? or a grill pan? I have never tried it with a broiler or a grill pan. That sounds like a great way to cook it if you don’t have a grill! Let me know how it turns out! I put it on the oven at 375 for about 25-30 minutes, came out perfect! This is delicious! My family loves it, I have made it 3 times within a matter of weeks. 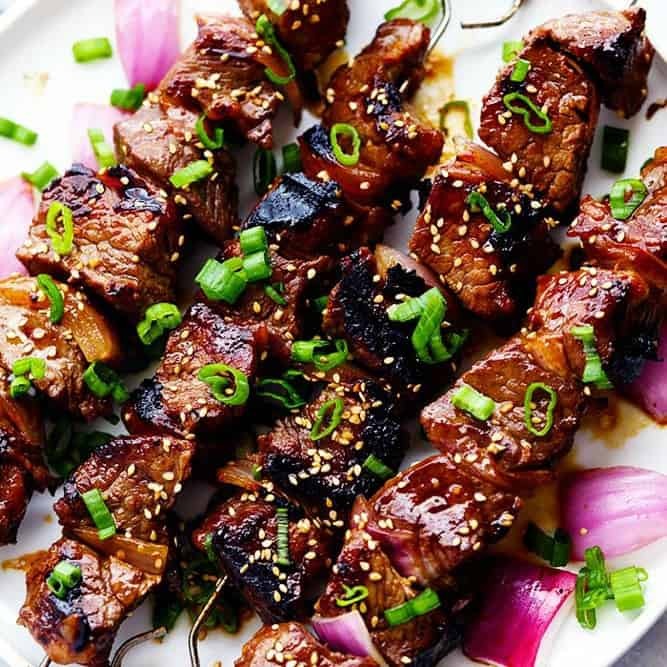 The marinade is so good that I use it on a variety of vegetables that we grill or stir fry. It has become a go-to recipe in our house! Any suggestions for sides to accompany this dish? Or do you just do rice? I’m marinating the meat right now. I am serving over rice with a side fresh fruit salad. These kebabs were delicious, any suggestions as to what to serve with, apart from jasmine rice?